Step by step tutorial building CRUD app from scratch using MEAN Stack (MongoDB, Express, Angular 2 and Node.js). MEAN is stand for Mongo, Express, Angular 2 and Node.js. This combination is popular in web application development. There is some MEAN stack bundle that ready use like MEAN.js and MEAN.io, but we are not using that ready to use the framework. We will do it from scratch creating simple CRUD app, using existing tools and generator that comes with Angular 2. Before we get started, there are few things required for building this MEAN stack web application. Using all tools above, we will create simple CRUD (Create-Read-Update-Delete) web application. We assume that you already install Node.js. We will use Angular CLI to create new Angular 2 application. Open terminal (Mac/Linux) or Node.js command prompt (Windows) then type this command to install Angular CLI. Now, type this command to create new Angular 2 application. Go to the newly created application folder. Run the Angular 2 application by typing this command. If you see "Webpack. 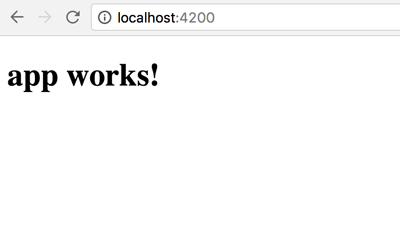 Compiled Successfully" in the terminal then open the browser then point to this URL "http://localhost:4200". You will see this page if everything working properly. This time will different than previous Node.js and Express.js tutorial. We will create required files for backend manually instead of generating new Express.js application. First, we install Express.js and Mongoose.js with their required dependencies. Just type this command. Then, add bin folder and www file inside bin folder. Open and edit www file then add this lines of codes. To make the server run from bin/www, open and edit "package.json" then replace "start" value. Now, create app.js in the root of project folder. Open and edit app.js then add all this lines of codes. Next, create routes folder then create routes file for the book. Open and edit "book.js" file then add this lines of codes. Because we point Express static path to "dist" directory which it is Angular build folder. For that, build Angular application first. Now, run the server using this command. Open your browser and point to "http://localhost:3000". You will see the same page as running Angular application. 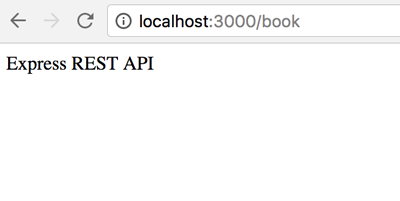 When you change to this URL "http://localhost:3000/book", it will show Express page. To create the REST API first thing to do is install Mongoose.js for creating a model. Open and edit app.js on the root of the project. Add require line for Mongoose. Create a connection to MongoDB database. Add this lines of codes after the require section. Create model folder and file for building Mongoose Model Schema. Open and edit Book.js file then add this lines of codes. Open and edit previously created file routes/book.js then replace all codes with this. Now, re-run our MEAN application. Open another terminal then type this command to test REST API. If that command return response like below then REST API is ready to go. To make REST API accessible from Angular 2 application first, create Angular 2 providers or services by typing this command. That command will create files required by book service. Add book service manually to app.module.ts. Put import for book service. Add it to @NgModule providers. Next, open and edit src/app/book.service.ts. Replace all codes with this codes. That codes using Promise response instead of Observable. To create Angular 2 Component, simply run this command. That command will generate all required files for build book component and also automatically added book component to app.module.ts. Now, we will create book list in book component. Open and edit src/app/book.component.ts then replace all codes with this. Next, we will edit the view. But firstly, add bootstrap library to index.html. To use book component as default landing page, open and edit src/app/app.module.ts the add import for Routing. Create constant router for routing to book component. In @NgModule imports section add ROUTES constant, so imports section will be like this. To prevent error 404 add this import. Then add this configuration codes in @NgModule providers section. Now, open and edit src/app/app.component.html then replace all codes with this. Back to src/app/book/book.component.html then replace all codes with this. Now, we have to test our MEAN app with only list page. Build then run the application. 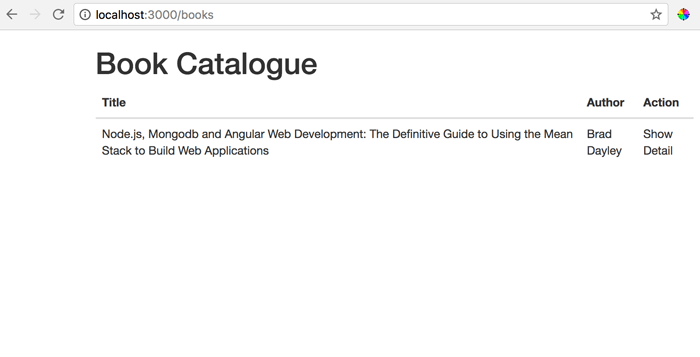 Reopen again 'localhost:3000' from your browser, it should be redirected to book list page like this. Open and edit src/app/book-detail/book-detail.component.ts. Replace all codes with this. Open and edit src/app/book-detail/book-detail.component.html. Replace all codes with this. To create a component for add new Book, type this command as usually. Add 'book-create' link on book.component.html. Now, open and edit src/app/book/book-create.component.ts then replace all with this codes. Modify src/app/book-create/book-create.component.html, replace all with this HTML tags. As usually, we will generate component for edit book. Type this command for doing that. Add route in src/app/app.module.ts so, it looks like this. Open and edit again src/app/book-details/book-details.component.html and add edit routeLink in the last line. Now, open and edit src/app/book-edit/book-edit.component.ts then replace all codes with this. Open and edit src/app/book-edit/book-edit.component.html then replace all codes with this. The last thing in this MEAN app tutorial is to create delete function that put on the book detail component. Open and edit src/app/book-detail/book-detail.component.ts then add this function. Don't forget to add import for Router and inject Router in constructor. Add delete button in src/app/book-detail/book-detail.component.html on the right of Edit routerLink. 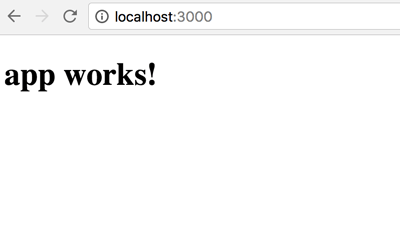 This is it, now we have completed build CRUD web application using MEAN stack with Angular 2. Rebuild the application then run again to test the fully functionalities. Please feel free to give suggestion or anything to improve this tutorial. The full source code can find on Our GitHub.